“Choosing to Die" [Terry Prachett's BBC 2 documentary on euthanasia] was billed, hyperbolically, as the first time the moment of death has been shown on television. It isn’t. Not by many, many deaths. What they meant was the first death of a white western man in a sitting room; there is death all over television all the time. Sri Lanka’s Killing Fields, Channel 4′s documentary on that country’s civil war, was made up of little else but the moment of death. Just before we get into it, I am going to pause, yet again, to have an eye-rollingly weary word about Jon Snow’s comic ties and jocund socks. And to explain why I mind and why they matter. The ugly garish ties are worn to semaphore the fact that this is a chap who is only wearing a suit because the headmaster says he must. Inside, he is really a far more relaxed, counterculture kind of dude, not at all the establishment flunky the two-piece single-breasted implies. It is a pathetically and worryingly childish pose in a man approaching retirement who wants what comes out of his mouth to be taken seriously. Back to the programme. 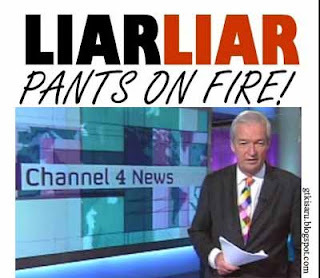 "Not a second of this has been shot by Channel 4; none of the eyewitness accounts comes from journalists." THANKS FOR SHOWING THE COURAGE TO TELL THE TRUTH WHILE EVERYBOY ELSE BEHAVE LIKE LOOKING AT "KING'S FAKE CLOTH"